It’s been a while. Two and a half months, actually. A lot has happened since I posted about triple chocolate doughnuts in early October. IronWhisk turned two years old, I finished my first semester of university, and I also turned eighteen. Unfortunately, I was not able to share any of those moments with you. I was not away, however, due to any of those events. I have been spending all of my free time working on starting a company called Gastromio, which will sell gourmet food ingredients online. After hearing countless stories on food blogs (and elsewhere) about the elusive hunts us foodie folk face when finding bizarre ingredients, I realized there needed to be an easy way to obtain small quantities of unique foods. I hope Gastromio will help. 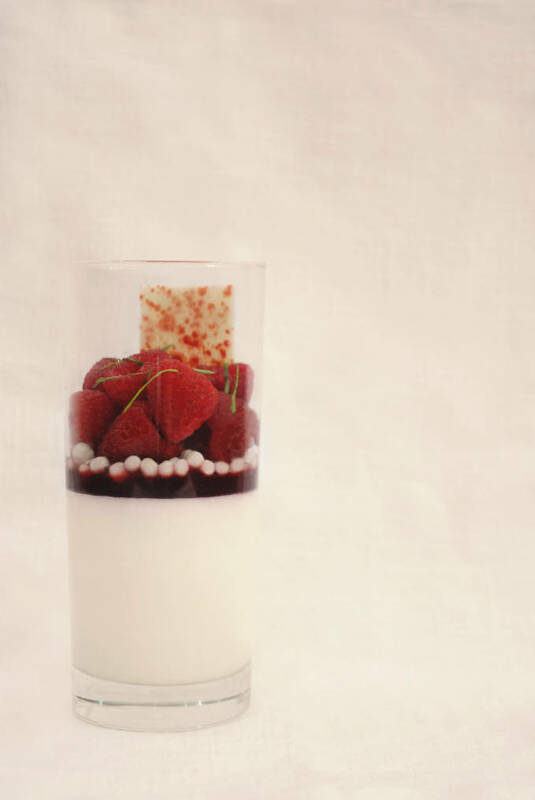 Raspberry and Greek yogurt panna cotta with crispy white chocolate pearls, fresh raspberry gel, juicy raspberries, and a white chocolate decoration. Greek yogurt panna cotta recipe adapted from Smitten Kitchen. Stir the gelatin and water together in a small bowl. Let sit for ten minutes. Meanwhile, whisk together the yogurt and the cream in a large bowl. In a small saucepan, stir together the milk and sugar. Bring to a simmer. Combine the milk and sugar with the gelatin and water, and then with the milk and cream in the large bowl. Divide evenly among six clear glasses, and place in the fridge to chill overnight and harden. Proceed to preparing the raspberry gel after the panna cotta hardens. Stir together the gelatin and half of the water in a small bowl. Let sit for ten minutes. Meanwhile, mix together the raspberries, the remaining water, and the sugar in a medium saucepan. Bring to a simmer, stirring occassionally and mashing the raspberries with a spoon. Strain the raspberry mixture into a medium bowl, and then mix in the gelatin-water from the small bowl. Let the mixture cool to room temperature, and then divide among the glasses. Let chill overnight to harden. 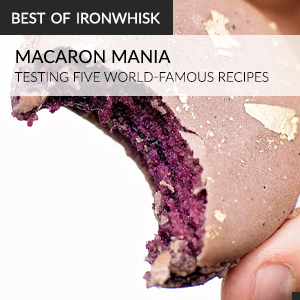 Cover the hardened raspberry gel with white chocolate pearls. Then, top with fresh raspberries and torn mint leaves. If using white chocolate rectangles, stick into the panna cotta. This panna cotta looks fantastic. Best of luck with your new food adventure. 2014 looks like a banner year for you! What a great idea for a company, I wish you all the best. Congratulations on your blogs second anniversary, that’s quite an accomplishment. During one of my shopping sprees for a photo shoot, I spotted some lovely balsamic beads that I thought I would mention because it would be incredible with a strawberry panna cotta! Gastromio sounds like a great idea, very unique.